Please note; a minimum order of 25 units for custom neck tubes applies. Our custom neck tubes are an excellent promotional product, extremely popular with charities, running clubs & cycling clubs. Whether you call them neck tubes, neck buffs or neck warmers, these versatile and multifunctional performance accessories offer protection from the elements and an opportunity to promote your charity, club or brand. Our bespoke neck tubes can be worn as a scarf, bandana, headband, hat, facemask or wristband. The sublimation print process we use also ensures you can replicate any design in any number of colours, allowing us to perfectly represent your brand, your club or your charity colours. 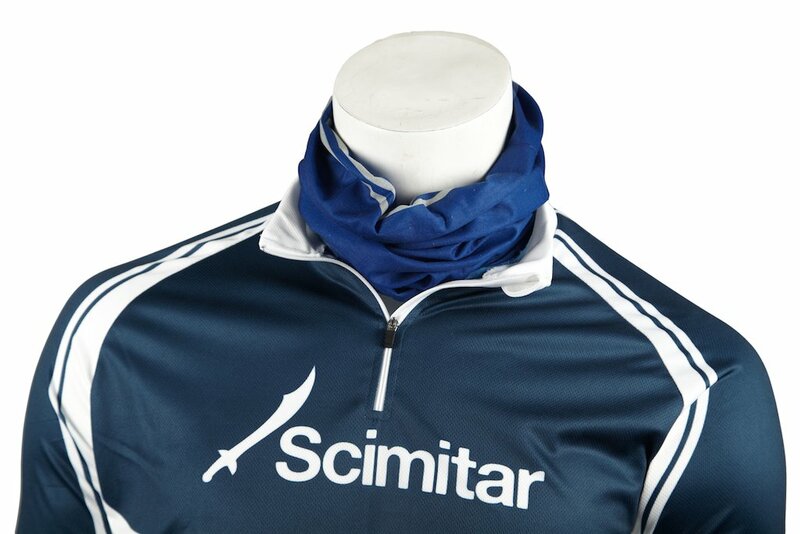 Custom neck buffs provide an excellent way for your brand to be promoted after the event as they become mobile advertisements whilst training in parks, on the roads or at team training sessions. Our exclusive Qwick-Dri™ moisture wicking fibres are designed to accelerate the movement of moisture away from your skin, rapidly maintaining body temperature and ensuring comfort at all times. Better still, Qwick-Dri™ fabrics wash on cool temperatures and dry quickly, naturally. Want to find out more about our neck tubes? Call the team today on 01905 425324, fill in our online forms by clicking on the ‘Get in Touch’ button or email sales@scimitarsports.com and we’ll get back to you within 12 working hours. WHY SCIMITAR FOR CUSTOM NECK TUBES? Leading UK supplier to the charity, running club & cycling club markets. Unbeatable pricing on premium custom neck tubes.